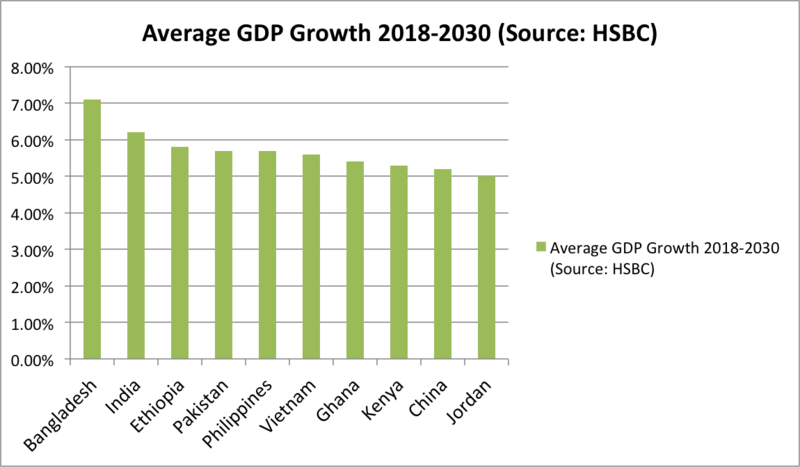 Recently released HSBC report titled "The World in 2030" says that "five Asian economies will be among the world’s six fastest-growing economies – Bangladesh, India, Philippines, Pakistan and Vietnam". 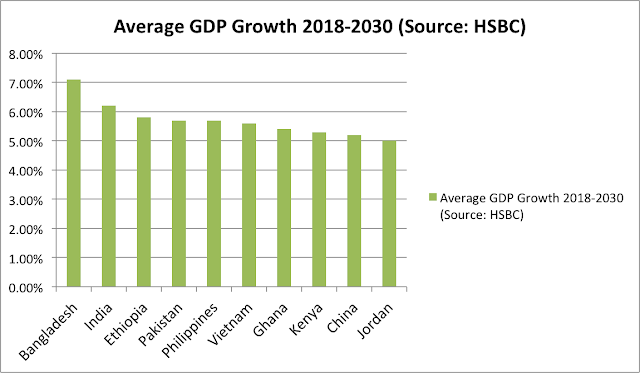 HSBC ranks Pakistan at number 4 in terms of GDP growth till 2030 and expects Pakistan to rise from the world's 40th biggest economy in 2018 in nominal terms to the world's 30th largest economy by 2030. Pakistan economy does face some short-term headwinds because of its balance of payments crisis requiring an IMF bailout. However, longer term prospects for growth look good. American business publication Wall Street Journal has produced a short video explaining how its staff sees what it describes as "US-China conflict brewing in Pakistan". What is at stake in the battle between China and the United States in Pakistan is the prize of global superpower status. Whoever wins in Pakistan will become the number one global superpower, says the Wall Street Journal. The HSBC report authors look at 75 economies in developing, emerging and frontier markets to make long-term projections of their growth potential and changes in global rankings. They conclude that emerging economies will account for roughly 50 per cent of global GDP by 2030 – a "seismic shift from half of that in 2000". The report forecasts that Asia will continue to be the biggest driver of global economic growth and highlights that "China will be the world’s largest economy in 2030, overtaking the US, while India - currently the seventh biggest - will be third, pushing Germany and Japan down a position". An earlier 2017 report by Harvard University's Kennedy School's Center for International Development (CID) at Harvard University forecast Pakistan's annual GDP growth to average 5.97% over the next 8 years, ranking it as the world's 6th fastest growing economy. Among the top 10 fastest growing economies, the CID projects Uganda to grow the fastest at 7.73%, followed by India 7.72%, Tanzania 6.66%, Senegal 6.49%, Madagascar 6.07%, Kenya 5.98%, Pakistan 5.97%, Indonesia 5.82%, Mali 5.75%, Turkey 5.64% and Philippines 5.43%. 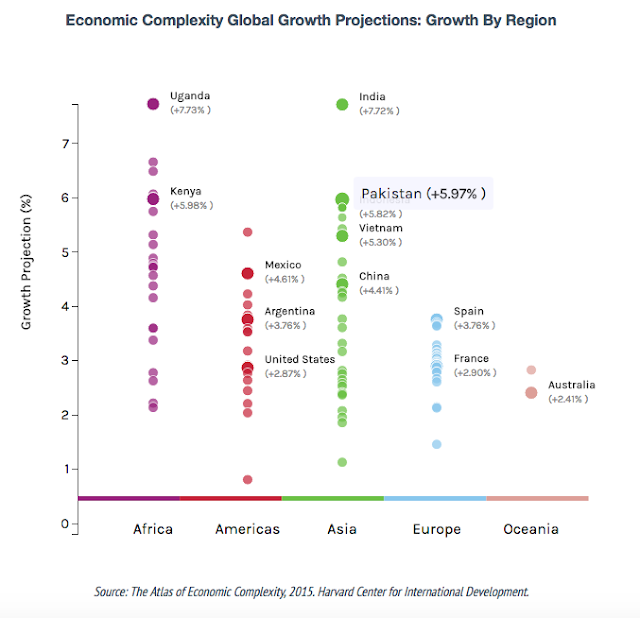 Among Pakistan's other neighbors, Harvard Kennedy School forecast China to grow at 4.41%, Sri Lanka at 3.77% and Bangladesh at 2.82%. Pakistan economy does face some short-term headwinds because of its balance of payments crisis requiring an IMF bailout. However, longer term prospects for growth look good. Improved security situation and rising investments, particularly the China Pakistan Economic Corridor or CPEC-related investments led by China, are helping accelerate the economic growth in the country. It is the fear of CPEC's success that appears to be driving a growing campaign of fear, uncertainty and doubt (FUD) waged by Pakistan's detractors in South Asia region and around the world. American business publication Wall Street Journal has produced a short video explaining how its staff sees what it describes as "US-China conflict brewing in Pakistan". What is at stake in the battle between China and the United States in Pakistan is the prize of global superpower status. Whoever wins in Pakistan will become the number one global superpower, says the Wall Street Journal. Bangladesh will be growing at 2.82%? Yeah that seems like a credible report!!!! Roy: "Bangladesh will be growing at 2.82%? Yeah that seems like a credible report!!!!" Bangladesh is heavily dependent on RMG exports for economic growth. "Many low-income countries, including Bangladesh, Venezuela, and Angola have failed to diversify their knowhow and face low growth prospects. Others like India, Turkey, and the Philippines have successfully added productive capabilities to enter new sectors and will drive growth over the coming decade,” said Sebastian Bustos, a lead CID researcher in trade and economic complexity methods." Bangladesh is the largest exporter of readymade garment products, after China. The sector employs an estimated 40 million workers, mostly women, and contributes to more than 80% of Bangladesh’s export earnings. THe near term is still difficult to get through. A deal needs to be reached with the IMF for over 10 billion dollars. Terms will certainly include measures to improve tax collection and likely further rupee devaluation. Hopefully that sets up the economy for both domestic and export growth. 6% per year means the economy doubles every 12 years or so. If they can keep up that pace till 2050, the economy should soar 6X and reach per capita GDP of 25-30000 dollars, basically developed country standards, though still half the income of present day Americans. The most important elements the PTI need to pursue is expanding primary and secondary education and improving infrastructure and public health. India ranks 51, Pakistan 91 and Bangladesh 111 on economic complexity index ranking 131 countries. Japan tops the rankings, UK is at 8, US at 9 and China 26. Valuations in Pakistan are very attractive post the recent correction in the market. Economic outlook though is of slower growth going forward. Potential IMF program can lead to further reforms as well as currency weakness. One of the companies we met that day was a previous “darling” of foreign investors about two years ago. The company produces air conditioners, refrigerators and freezers, as well as power equipment such as transformers and meters which we thought at that time should benefit from better power supply and investments in the power sector and generally low penetration of refrigerators [only 47% of households have a refrigerator and 52% a washing machine]. However, the company has been especially hard hit in the last few months since the Pakistani Rupee was devalued from around 105 to the USD to the current 128 and generally companies in Pakistan cannot hedge their foreign currency exposure. For this company, an increase of 1 PKR against the USD is equal to 150 million Rupees in additional costs which the company has been able to only partially pass onto customers. Additionally, a relatively new Chinese entrant in the aircon market was able to gain significant market share in only 5 years and is now the major player. Other companies we met in Lahore were in the insurance and cement sectors, the latter being one of the dominant industries in Pakistan. The cement sector in Pakistan especially benefitted from the heavy Chinese infrastructure investment into the China Pakistan Economic Corridor [CPEC]. The Chinese government and Chinese companies have committed so far to invest over USD 60 billion into infrastructure projects in Pakistan, including roads, ports, bridges, railways, dams and especially power generation [mainly coal fired]. The cement industry grew in 2017 on average by 15% compared with 5% on average over the past 25 years. Thanks to the boom in the cement sector many companies announced and started expansion projects, especially in the south which allows them to export some of their cement or clinker to neighbouring countries, East Africa or even to South Africa. Later in the afternoon we took a flight from Lahore to the country’s largest city and commercial centre, Karachi, on Pakistan International Airlines [PIA], which is still 85% owned by the Government [Ministry of Defense] and last year lost USD 30 million each month. The company just changed its CEO and he wrote in the in-flight magazine that he will turn PIA around and the airline will have the “best entertainment system in the world” – let’s see! The aircraft was an old Boeing 777-200 and several signs such as the exit, restrooms and no smoking are still written in Vietnamese, maybe because the previous owner of the aircraft was Vietnam Airlines. We also noticed a Vietjet [a Vietnamese budget airline] aircraft on the tarmac right next to us which was obviously “wet leased” to PIA. We arrived safely in Karachi after a 1 hour and 20 minutes flight, and the hotel bus drove us through heavy traffic on the three-lane highway with many newly built bridges and flyovers to our hotel in Clifton. One sign of optimism came from a CEO of one of the leading textile companies in Pakistan. They received in the past several weeks more orders from U.S. textile buyers, especially for low end products as imports of low-cost textiles from Pakistan, Bangladesh or Vietnam will face a 0% duty, while imports from Chinese factories will be taxed at 10%. This particular CEO was also of the opinion that textile companies in Bangladesh and Vietnam are working at almost full capacity which is not the case in Pakistan since Pakistani textile companies cannot compete with Bangladesh due to, in his view, the overvalued Pakistani Rupee. Most of the meetings were held at the Movenpick Hotel in Karachi and I was looking forward to our final two meetings which were with a food/snack company not far from the hotel and a pharmaceutical company, based in one of the industrial areas situated near the Karachi Port. The drive to the pharmaceutical company was unique as in the middle of the congested roads it is still possible to come across carts pulled by horses, donkeys and even camels. Also, very unique to Pakistan are the colourful painted buses and trucks which dominate the roads in busy Karachi. Obviously in almost every conversation with C-level executives the topic of the new government under the leadership of the newly elected and former cricket player, Imran Khan, came up. Imran Khan assumed office on 18th of August 2018 and his government is already meeting a lot of high expectations from the public. Khan needs to quickly resolve some pressing economic issues like the low US Dollar reserves that are currently just 9 billion USD due to a chronic current account deficit which puts the Pakistani Rupee under further devaluation pressure as well. Khan already increased the gas prices for individuals and industries in order to reduce the subsidies and it is further expected that the price for electricity will be increased soon too. The new government is continuing to implement an existing policy introduced by the previous government which requires passenger car buyers to provide their tax filing number when purchasing a car in order to bring in more individuals to the tax net. Generally, it is expected that interest rates will rise further, back to double digit levels, and that the Pakistani Rupee needs to devalue further against the USD from the current level of 124 to about 135 to 145 in order to make the country competitive again for exports [mainly textiles at the moment]. One of the most important and urgent economic tasks for Imran Khan’s government is the decision of how to finance the ever-growing current account deficit [due to higher imports and stagnant exports] and to stock up on their depleted foreign exchange reserves. Khan has basically two options: go to the IMF [again for the 22nd time in the history of Pakistan] or ask for additional loans from China and/or Saudi Arabia. In this respect, everybody I asked was of the same opinion: bite the bullet and go to the IMF. Therefore, it is not surprising that the government has just announced that they plan to begin talks with the IMF for a loan program. One CFO of a diversified conglomerate described the expectation of the new government as “lots of optimism but also realism”: voters are optimistic that the Imran Khan-led government can change the country’s course towards a better future, but the same people are also realistic that it will be a huge challenge to overcome the current financial situation Pakistan faces at the moment. Investors can gain exposure to Pakistan via an ETF such as the Global X MSCI Pakistan ETF (PAK) or through the London listed GDR's of OGDC (Oil & Gas Development Corp.), UBL (United Bank), and Lucky Cement. The Global X MSCI Pakistan ETF (PAK) is primarily made up of large cap Pakistani companies with large exposure to banks [30%] and energy [26%] stocks and has a total 36 holdings. This ETF currently has around USD 39 million of assets under management and trades at a P/E of 7.5x and since inception of the ETF on 22nd April 2015, it has returned -31.9% while the KSE Index has returned +7.2% in USD terms during the same period.